Content Marketing: How Can You Promote Sales on LinkedIn? You are here: Home / Blog / Content Marketing: How Can You Promote Sales on LinkedIn? Content Marketing Institute/Marketing Profs study showed LinkedIn as #1 for effective B2B content marketing. 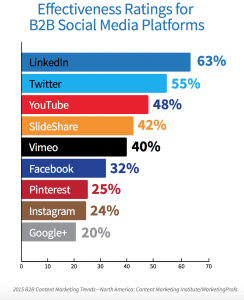 B2B marketers rank LinkedIn as the most effective social media platform for content marketing. In a 2015 Content Marketing Institute/Marketing Profs study, 94% of B2B content marketers use LinkedIn. 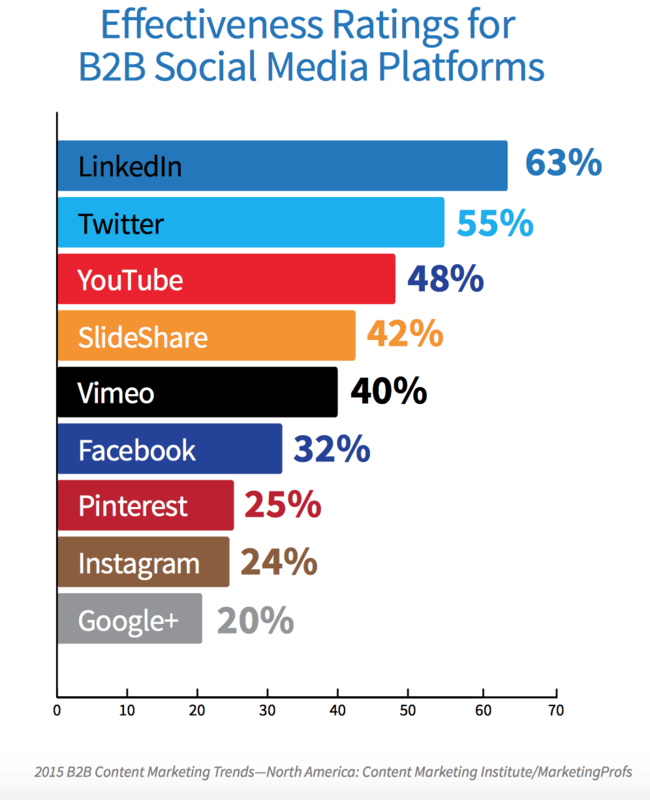 And 63% of marketers find LinkedIn the most effective social medium (vs. 55% for Twitter and 48% for YouTube). LinkedIn content marketing produced sales at Tellabs. Ever since, I’ve seen it as the social medium where B2B content marketing begins. It’s a good place to test the waters with your customers. Here’s how. 1. Polish your personal and company profiles. Make yourself easy to find on LinkedIn. Create a personal profile that’s complete, with a good portrait photo, biography, experience, publications, affiliations, groups, education and more. Establish your company’s LinkedIn page and actively post on it. Keep it lively. Warm it up too. LinkedIn is a place to be human and personal, not corporate or standoff-ish. 2. Build your networks. As you meet new people, use their business cards as a reminder to connect with them on LinkedIn and other social media. Once you’ve connected with people on LinkedIn, extend your connections on Twitter, Facebook and other social media. Follow customers’ Twitter and LinkedIn streams to help you learn topics of mutual interest. 3. Help educate buyers. LinkedIn is a place to share, not a place to sell. So help first, sell later. Post useful, timely information that’s of value to potential customers. Answer questions. Ask thoughtful questions. Provide referrals. Learn what’s working by measuring shares and likes, and do more of what works. People go to LinkedIn for interesting content. In fact, content pages on LinkedIn get 7 times more views than job-related activities, says Jason Miller of LinkedIn. Share content that provides customers with valuable insights. Tell customers something they didn’t know about a problem or opportunity they didn’t know they had. That’s the key to moving customers beyond the status quo and advancing the Challenger Sale. 4. Join and participate in pertinent groups. LinkedIn offers a wealth of professional groups — more than 2 million industry and interest groups so far, with new ones formed every day. By targeting the right groups, you can discover people of like mind. You’ll find people who are in your industry, who are interested in a particular topic, who go to the same professional associations, who attended your university and more. You can get as much out of LinkedIn groups as you put in. Participate to learn what are your customers’ top-of-mind topics, worries, needs and questions. Customer questions make rich inputs for your content marketing strategy. Look in particular for the most challenging questions buyers must address during the buying journey. For example, Tellabs created a white paper to address a key, controversial technical question for electric utilities. We posted the paper in the Utilities Telecom Council (UTC) LinkedIn group, which focuses on telecom networks for power utilities. The top-line answer is, “It depends.” The in-depth answer is, it depends on exactly which set of communications services a utility needs. Utilities employ dozens of different services to keep the business connected. Tellabs took a neutral position on this question, since it offered both T-1 and Ethernet solutions. In contrast, most of our competitors only sold one type of equipment or the other. A couple of days after posting the paper, we got a super-technical question from a member of the UTC group. It was way over our heads. In fact, the question was so technical that even a product marketer couldn’t address it. So we scrambled to recruit an engineer from the strategy team. We helped him quickly join LinkedIn and the UTC group. There, he addressed the question himself. After some back and forth, UTC invited our engineer to speak at its conference. His speech led to several inquiries from utilities, which we tracked both manually and through marketing automation. That’s how we demonstrated that a number of sales to electric utilities started with this very white paper and speech. We proved that content marketing in LinkedIn groups could create customers and generate revenue. You can do that too. 5. Use SlideShare. Valuable but underused, SlideShare enables you to share presentations online. Try it out. It’s a great opportunity to establish your expertise in given topic areas. • Get executives involved so that others follow their lead in social media. In particular, involve the head of sales, marketing, products and the CEO. • Train your most-networked people on how to improve their profiles and build their personal brands. For example, start with employees who already have a network of 500 or more people. • Personal training is more effective than group training, in terms of getting employees to post. Offer help to employees one by one as they get stuck. • Set up a day when employees can get professional portrait photos taken for their social media profiles. • Provide relevant content regularly to employees, sales and distributors so they can post it on their LinkedIn pages. • Measure LinkedIn results and report back to the ambassadors. Recognize and reward those who post the most, who increase their Klout scores, or who connect with potential customers. This question, “How do you promote sales on LinkedIn?” came from Julie Daniel at Quest Products. She heard my recent presentation on social media at the B2B Marketers Group. Thanks for your great question, Julie! Content Marketing Question: How to Link Content to Sales?